I am currently in Hong Kong, I am an Australia Business Holder (Andy Perry Ltd). 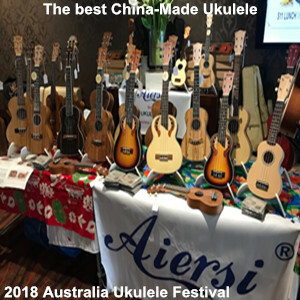 Are you in a position to be able to send a demonstration model to me whilst here in Hong Kong of this “Flame Maple Gypsy Jazz Grande Bouche Guitar Model GP-056T” with a foam case? If not, what is the very lowest price for a demonstration model with a foam case? 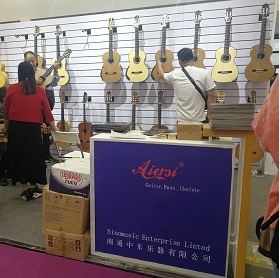 The reasonable price one but, very beautiful maple guitar Aiersi guitar is all nice instrument. I bought the maple gypsy guitar model GP-056T two weeks ago straight from Aiersi manufactory. I’m living in Belgium and on 9 days I received it. The tracking and the packaging are amazing. Concerning the gypsy guitar model Macaferry ( Grande bouche – D hole ) the instrument is perfect, the sound is the one you expecting for ( manouche type ). The back and sides are marvelous – Wood colour perfect. Just one thing, you must be having played those kinds of instruments before, because otherwise you gonna hurt your fingers, because the distance between the fretboard and the strings at the 12 th fret is at least about 6 millimeters. You can do something to make it better, just sand a little bit the bridge, and put “Argentine” strings on the instrument. The sound will be there. 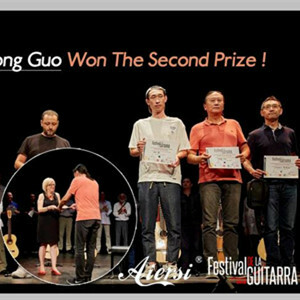 Concerning Aiersi guitar I forgot one thing, it’s to thanks a lot Mister Devon Zhu for his avallabality and his kindness. It’s him who is in charge for Aiersi and he was following all my mails personally. In september of this year I ordered a gypsy guitar GP-056T. The guitar had been sent to me with fedex shipment company. The guitar arrived in perfect condition in 10 days approx. The guitar is marvelous and sound great. I’m using it each day and the sound gets better and better really gypsy sound. Thus I decided to buy another one the gypsy model GP-03TS. Ordered in oktober I didn’t received it yet. I hope to be able, one of those days, to put a comment concerning that guitar on the site. I ordered a spruce top a week ago and received it yesterday via Fedex. Six days to come to France from China, wow. The guitar was really well secured and the packaging quite hard to open which felt great about what was inside. The hardcase is really nice, with leafs engraved in it and once you open, here it is. The GP-O5TS is a really nice guitar, finitions are really good. Very good stuff for a very low price. Now I will see how times affects it but I am really confident.